The tom may stand up to 48″ tall and weigh 1 0- 35 pounds, while the hen is smaller at 36″ tall, weighing between 6-14 pounds. Domestic turkeys can weigh two times that of a wild turkey! Feathers are greenish-bronze in color with “metallic rainbow hues” of gold and copper. The tom has a fleshy growth near his nostrils called a snood. When he is excited, the snood will expand and droop over the beak. Once he relaxes it will shrink back to its original size and position. He also has a beard of long, thin, black feathers that hangs from his chest. Both toms and hen have fleshy folds of skin at the front of their necks called caruncls. Swamps, fields and open woodlands. Southwest Canada and New England to central and southern Mexico. Seeds, berries, fruit, grasses, leaf buds, acorns and other nuts, roots, tubers, insects and amphibians. 6-7 years in the wild. The tom fans out his tail feathers to display during breeding season, which is in mid-March to May. He will breed with as many hens as possible. The hen will lay 8-15 pale cream, speckled eggs which she will incubate for 4 weeks. The poults can fly at 2 weeks of age and are independent at 3 months. 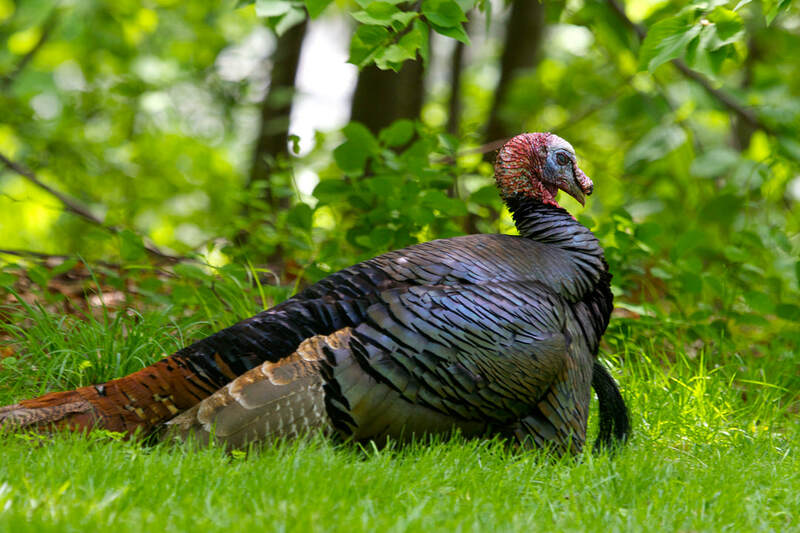 Wild turkeys are common in many states, with some states permitting seasonal hunting. They are quite common in Connecticut. Wild turkeys are usually seen feeding in fields during the day. This heavy-set bird can fly short distances and will perch in trees at night to avoid predators. They have been recorded with flight speeds of 30 mph! Not all domestic turkeys can fly. The male is called tom or gobbler, the female is a hen, and the young are called poults. Connecticut’s Beardsley Zoo has turkeys on exhibit with the pronghorn and bison. 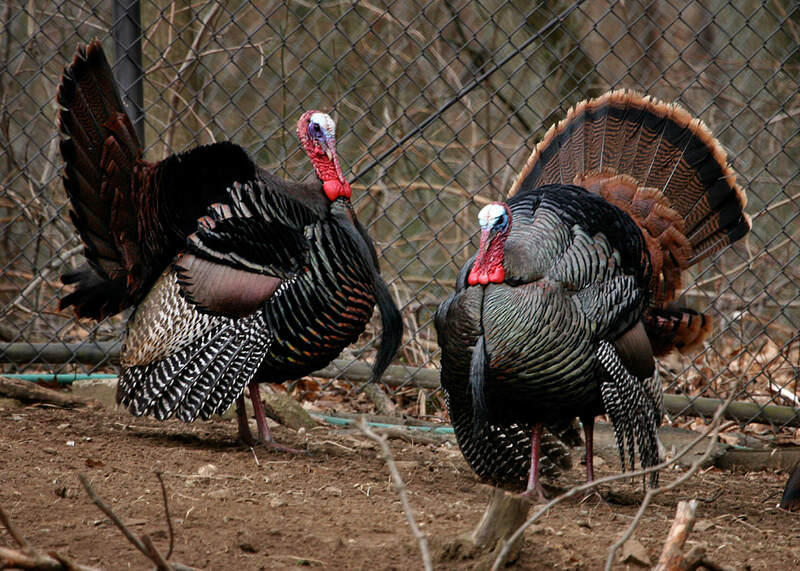 You may also see wild turkeys throughout the Zoo grounds on occasion.